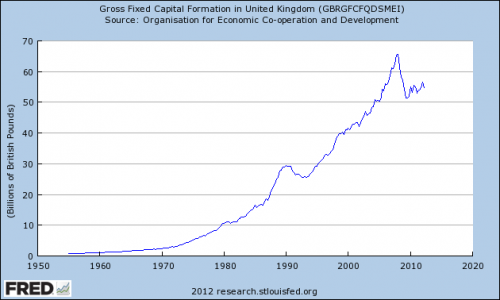 Definition: Gross fixed capital formation is essentially net investment. It is a component of the Expenditure method of calculating GDP. To be more precise Gross fixed capital formation measures the net increase in fixed capital. Gross fixed capital formation includes spending on land improvements (fences, ditches, drains, and so on); plant, machinery, and equipment purchases; the construction of roads, railways, private residential dwellings, and commercial and industrial buildings. Disposal of fixed assets is taken away from the total. Investment is usually highly cyclical. 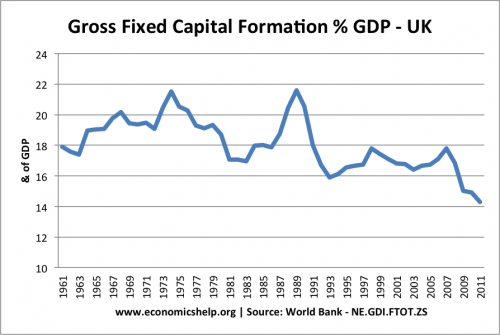 (See: accelerator effect) The recessions of 1991 and 2008 saw a sharp fall in gross fixed capital formation. This is because if output falls, firms expect to make lower profits, therefore they start to think of cutting back output rather than increase it. 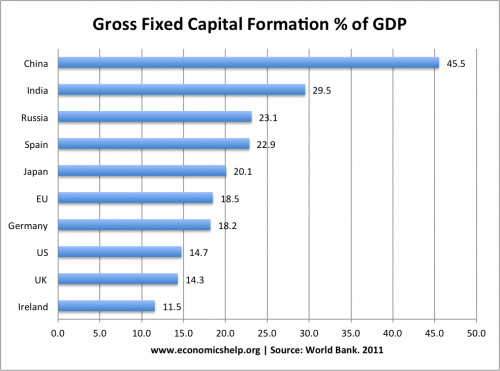 Generally speaking, developing countries often devote a higher % of GDP to investment. Countries with rapid rates of economic growth are heavily investing in more fixed assets to enable rapid economic growth. China has one of the highest rates of gross fixed capital formation. China’s high rate of economic growth has been spurred by devoting a significant percent of resources to investment. Investment increases both aggregate demand, but also increases future productive capacity. The UK and US economy are more geared towards consumption spending. Some of the poorest countries, cannot afford investment, and so concentrate on current consumption. For example, at the height of the Zimbabwe crisis in 2008, investment fell to less than 3% of GDP. 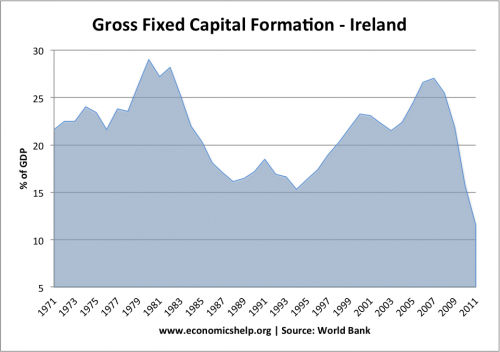 Irish investment is a mirror of their economic performance. After recovering from an economic slowdown in the 1980s, the boom years saw rapid growth in investment. peaking at over 26% of GDP. However, with the onset of the credit crunch, investment has fallen to just 11% of GDP. 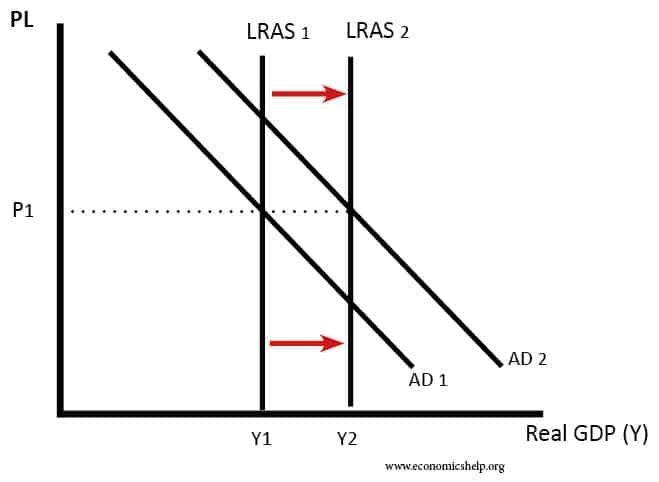 In macro theory, a rise in investment should contribute towards higher aggregate demand (AD) and also increase productive capacity (LRAS). Increasing investment should lead to higher economic growth in the long-term (though it depends on how effective the investment is. The opportunity cost of gross fixed capital investment is lower consumption – at least in the short-term. If more resources are spent on capital goods, it leads to decline in consumption of consumer goods. With an economy operating on the PPF (no unemployment) an increase in capital consumption leads to move from A to B. 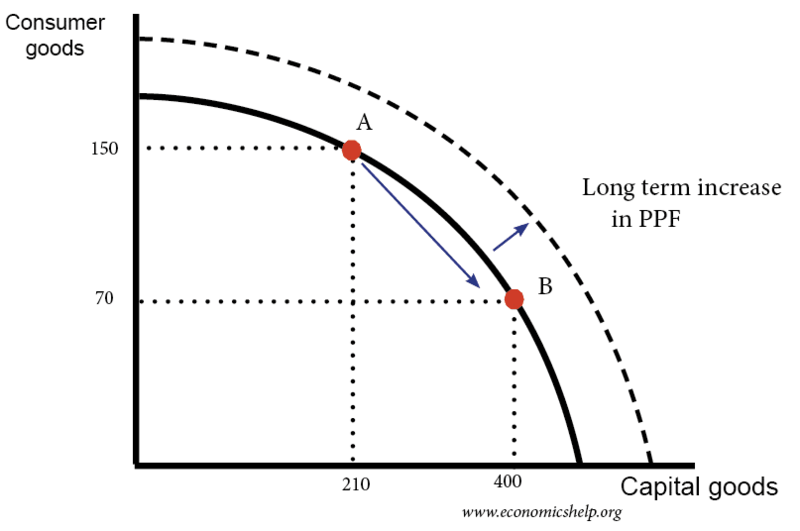 But, in long-term the investment can enable greater productive capacity and PPF curve shifts to the right.